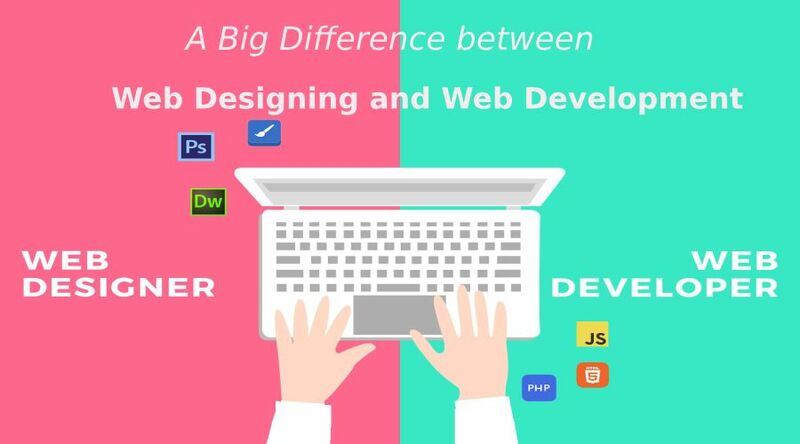 There has been a big difference between web designer and web developer. For the reason, the web developer is the developer who is the man with the logical mind. Whereas web designer is the artistic minded one who designs the look of the website. Therefore the best web designing service is the combination of both designing and developing. Each web development company needs both web designer and web developer. If the website giving the best user experience it means its designing and developing service is excellent. For instance, we can take the example of a car to explain more about the difference between both factors of the website. A car made with the help of designer and developer also. Hence the outer look of the car, seats, comfort, and style is designed by the designer. While the engine, wheel, and transmission of the car being developed by the developer. A web developer is a person who is assigned for the front end and back end of the website. With the help of a developer, you can emphasize the smooth functionality of the website. Apt coding also that the website runs technically smooth on the search engines. And the designer is the person who emphasizes on the outer look and attractiveness of the getup. Therefore it mainly focuses on the outer beauty of the website. While the developer is responsible for working for the website. When an architect creates the layout of the home. Before the engineer starts developing the idea for the building strong. Hence the web designers perform the task for creating the designs of the website with the help of their incorporating vibrant ideas or the stories into a design. For the reason that is visually appealing and providing you the best web designing services. They are dubbed as UX Designer or User Experience Designers. For the reason many of the providing custom web design services that are efficient of using a logo, graphics, and image design software like Adobe Photoshop, Inkscape, GIMP, Adobe Illustrator, etc. They also incorporate Typography, Color Palette, Storyboards, Mockups, Branding, Wireframes and Call-to-action buttons for the layout. They use prototyping tools like Mock plus and UXPin. Balanced light and dark color contrast, highlighting certain information tabs, creating a consistent and clean rhythm and uniting specific categories are what their skill is. We all know that User Experience designers create low fidelity wireframes and they are having high fidelity prototypes along with defining information architecture, persona and scenarios. The designers who are user interface designers. They create corresponding interfaces with the logos, templates, layouts, buttons, illustrations and other elements. For the purpose of front end development. When we talk about the developer, for the front end development. The developer creates markup, scrolling, pagination, drop down menu and animation, font families and implement typography with a scripting language. This development ensures you to interact with the web resource. For the Back-end Development, on the other hand, developer requests control and manages a database of the dynamic data so that they can be used or updated later. Keeps track of latest design trends remains consistent in the long run with global giants and makes the website easier to navigate. Typography, readability, color themes and branding are also done by designers. The difference is also evident in the annual salary –a grade third developer earns around $101,962 annually while the designer manages around $77,458. However, the salary varies according to experience, institution, and the project. A developer’s strategy is based on how user-friendly and navigation-friendly the design is –with a dull outer look, a developer cannot make the website appealing, no matter how much effort he/she puts on tools and coding. Hence both designer and developer share a symbiotic relationship where both depend on the other to make the website run efficiently to make it Best web development services. With growing demand, it is also evident that many hybrid designer-developers are making the best out of this business.